Along the course of a career, you’ve probably had the good fortune of receiving a little nugget of golden insight, or perhaps, a tip here and there from a boss, manager or other respected colleague. But it’s not like executives are just strolling down the hall, coffee cup in hand, spouting management advice at passersby. Truly valuable insights are rare finds. Go ahead and indulge your knowledge-hungry minds on the 19 responses we collected below. The next time you’ve reached a business impasse as a leader, take out this list. Apply it. Conquer. Then add your experience, what you learned. Repeat. Pretty soon, you’ll be the leader sharing the advice rather than seeking it. The best way to turn leadership advice into action? Make it official. 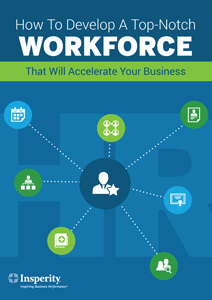 Download our free e-book, How to Develop a Top-notch Workforce That Will Accelerate Your Business, to learn how to put in place a long-term HR strategy that supports future growth and a winning corporate culture. Got leadership advice of your own? Share it with us. Leave a comment on Twitter using #TipsToLeadBy. We can’t wait to hear from you! Helpful information. thanks for Sharing! Excellent list to live by– thank you! It really is! Thanks for your feedback – glad you enjoyed the read! Please keep me in the loop as sharing incites and information is critical to everyone’s success. We agree, Jack – helpful information is for sharing!